Question: What would of happened if the USA did not involved? Summary: The Suez Canal was built by French and British for transportation purposes to give access from Mediterranean to Indian Ocean. USA was building the Aswan Dam in Egypt which would be power for North Africa. 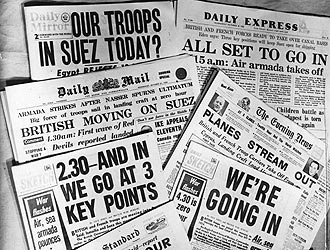 Nasser threatens Israel and nationalizes the Suez Canal which caused stress for the US ad Arab countries. UN resolved the Suez Crisis by using Lester Pearson's UN Peacekeeping force idea. The Israelis were given access to use the Canal and their economy flourished.